My husband told me that this post was going to be the end of my fashion blogging career, that after modeling a fanny pack, no one would ever listen to my style advice again! I’m going to admit that it’s not the easiest look to pull off over forty! My first outfit try was a disaster (and no, you can’t see it). But here, paired with some street style and attitude, I totally think it works. I was motivated to take this fashion risk by Kelly Dempsey, who charmed me with her fun style and her sweet personality on last season’s Project Runway. Kelly makes these fanny packs and sells them on her website Rack Addik. I choose a simple black quilted fabric, though there’s plenty of bolder choices if you’re feeling adventurous. 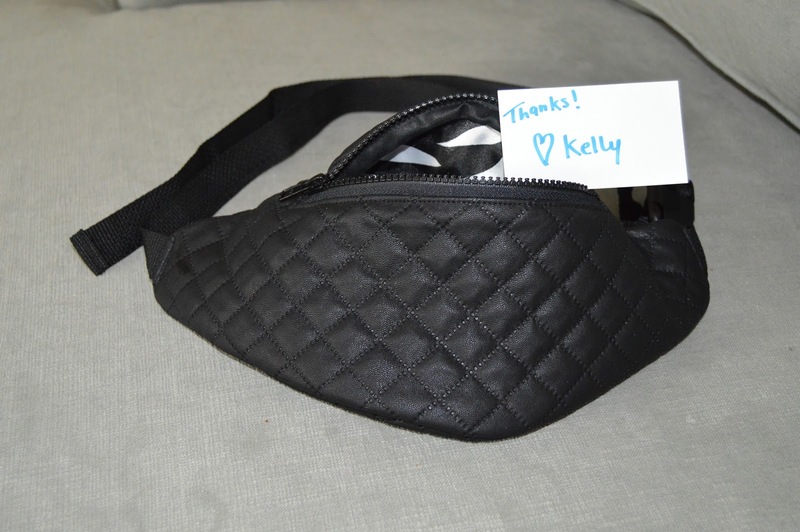 I adore the cool zebra lining and the personal note from Kelly as well. So, what do you think, Dolls? Did I pull off a fanny pack? Wishing all my readers the very VERY best in 2016! Don’t forget to join the link up party. Sexiest Fanny Pack wearing hottie I've ever seen!! I think it exploded your blogging career, because it's real and that street style tude make us smile who love ya!!! You pulled it off with gusto!! Happy weekend!! You made a fanny pack look good! You rock the fanny pack so well! Thank you for hosting and hope you are having a fab week! I could never pull it off as easy as you did – Happy New Year! Thanks for the link up, Dawn! Have a great weekend! Well done, Dawn Lucy! I think you styled your pack perfectly! Love the shoes, by the way. Thank you for participating in How I Wear My: Gloves this month! I think that you are on the leading edge of an up and coming trend. A fanny pack can be very practical when you need your hands to be free but still need to carry a few basic items with you. I recall seeing a spread last Spring in a fashion mag about fanny packs being worn by a few celebs and I'm surprised that I haven't been seeing them in the stores. I gave my 20 yo daughter one with a zebra stripe motif and she loves it. You look adorable! But I just can't do it!! Hahaha! Takes me back to summers at cedar point and everyone with florescent fanny packs. Oh you're gonna hate me but I couldn't help but smirk like a naughty teacher at fanny pack! When my American sister-in-law first came to live in the UK when these were still in fashion, I had to explain to her that here, fanny meant something VERY different!!! She couldn't understand why she kept getting odd looks or laughs when she said it! Big yes to pulling the look off, not easy to do but you've done it! But no, I think its time has come and gone. Thanks for the party Dawn. I am with Petite Silver Vixen haha. When I read fanny packs I was like whaaaaaaaaat because fanny means something totally different where I come from and in Australia as well. You pulled it off beautifully. Happy 2016. Ahh, YES! You did pull it off, fabulously!! And, that is the most attractive fanny pack I've ever seen!! You should see the one my mom still has… lol! Oh well, you can try anything. Once. Maybe twice. The hands free is a good thing, though. Have a great weekend! Haha I didn't even notice it in the first pic. The street style outfit works with it. Happy Friday! Hmm, I wouldn't say I'm convinced that the fanny pack needs to come back. Belt bags, on the other hand, I really like. They make more sense to me, as they serve two purposes and therefore must be genius inventions! Kudos to you for giving it a go, though! While in Cabo last Spring, I saw all the "young" girls wearing fanny packs. Not sure that I would wear one, but that black quilted one really looks good on you. Thanks Colleen! I think it will be easier for the youngsters to get on board with the trend, since they don't have the bad memories from before! 😉 Hee! We have to always remember to not listen to our husbands! Lol! I actually like this chic fanny pack. Love this casual chic look! Your quilted fanny pack is so cute and you are definitely rocking this look! I don't think I could pull it off! Your so funny! Yes, you pulled off the fanny pack look! Your husband need not worry. You are definitely working this pack! I like the quilted black and think it actually looks pretty chic. I think you are totally rocking it! I love the heels you added. CUTE! I think fanny packs just need a new name and they would become super popular. I think hands free shopping is the bomb!! I think you made it this time. Cheers! I would need to turn mine around so it litterally was a "fanny pack" , could use some more there….hehhe.. Love the black and grey too, like the quilted. This is totally my style…love the shoes and top! You always look so gorgeous and chic! You did it! You made the fanny pack look cool. I think they may be making a comeback and oh so practical. And, the fact that it is a black quilted fabric makes it oh so chic!! So great to co-host with you on My Refined Style. Haha…I haven't seen a fanny pack in a long time! I have to admit they are really convenient – you don't have to worry about holding or losing your bag. But if anyone can pull off a fanny pack its you. You are giving it some sass and style! That said I do think you've totally pulled it off – it's so long since they were first around that they're kind of retro now. Loving the t-shirt too, it's like those gorgeous heels and the tee were made for each other! Thanks so much for hosting, see you at #iwillwearwhatilike on Monday! It makes me so happy to see you linked up with FFF, Catherine! Thank you! Great look Dawn, hehe I love the word fanny pack, as I see in the comments you know why I had a little laugh 🙂 We call it a bum bag here, still a fun name eh!? you look so chic! loving your outfit! I think it looks great! It's also very practical – you may have started a new trend!